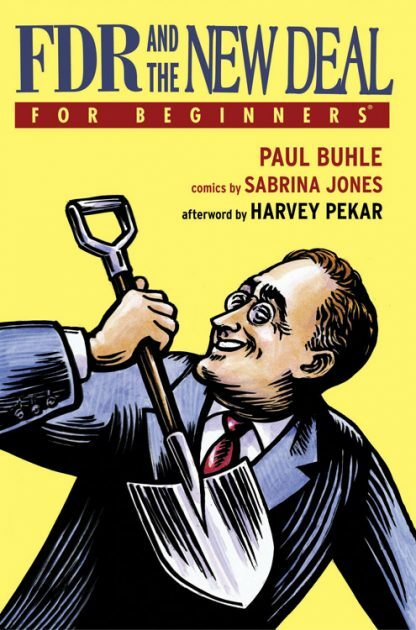 A profusely illustrated, popularly-written volume with original comic art, FDR and the New Deal For Beginners will shed new light upon a story now regaining visibility thanks to the recent economic crisis and prominent reformer, President Obama, in the White House. The history of the precedent-making FDR administration through the bitter economic depression, with expansive programs empowering artists and working people, comes alive as the grandest social experiment in the history of American democracy. For the first time, the lives of the president, the first lady and the ordinary people of the time will be seen through an inventive comic narrative accompanying historic illustrations and a sympathetic but not uncritical text. Paul Buhle, recently retired as a Senior Lecturer at Brown University, has written or edited forty-two books. Sabrina Jones wrote and illustrated Isadora Duncan, A Graphic Biography. She is a longtime editor and contributor to the political comic book World War 3 Illustrated. She has created nonfiction comics for Wobblies! A Graphic History of the Industrial Workers of the World; Studs Terkel�s Working: A Graphic Adaptation; and Mixed Signals, a counter-recruitment tool in comic book form. She lives in Brooklyn and paints scenery for Saturday Night Live.